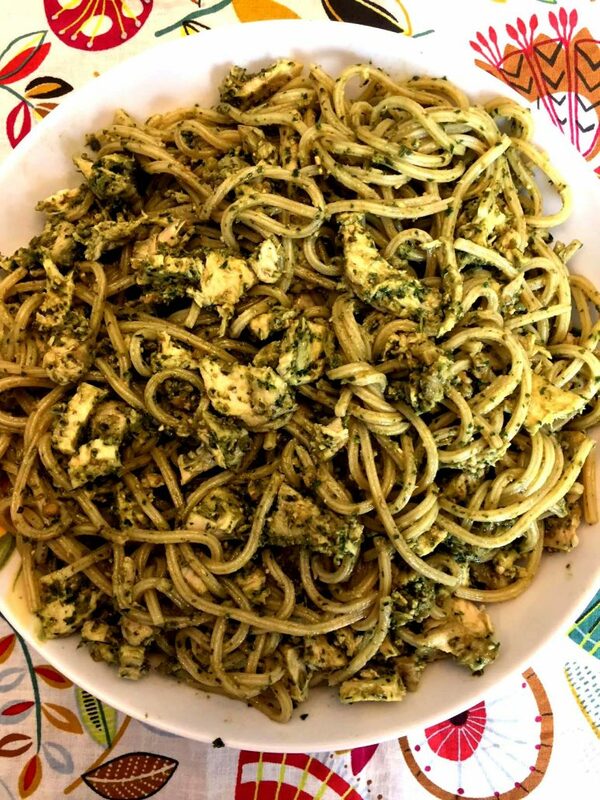 This chicken pesto pasta is so easy to make and so delicious! Dinner on the table in 15 minutes – yes, please! 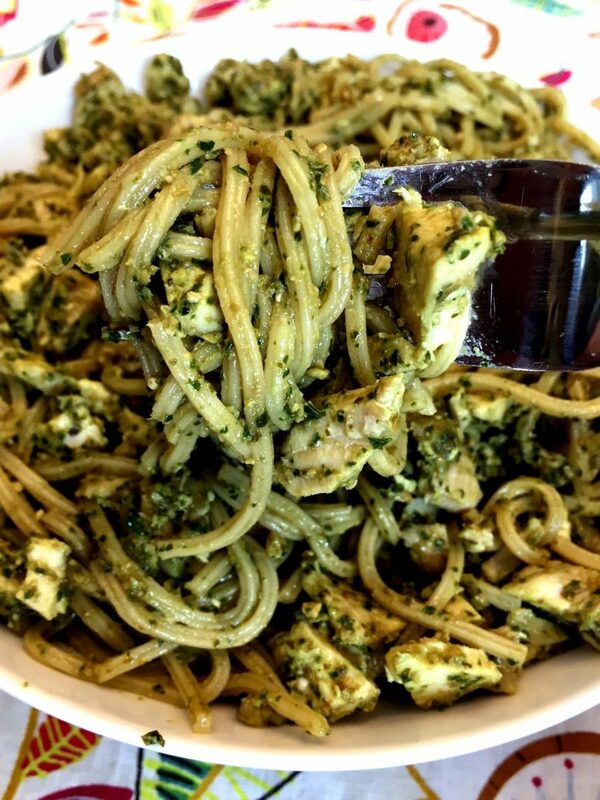 I love easy dinners, and this chicken pesto pasta is one of my favorites in my “lazy dinner” rotation. 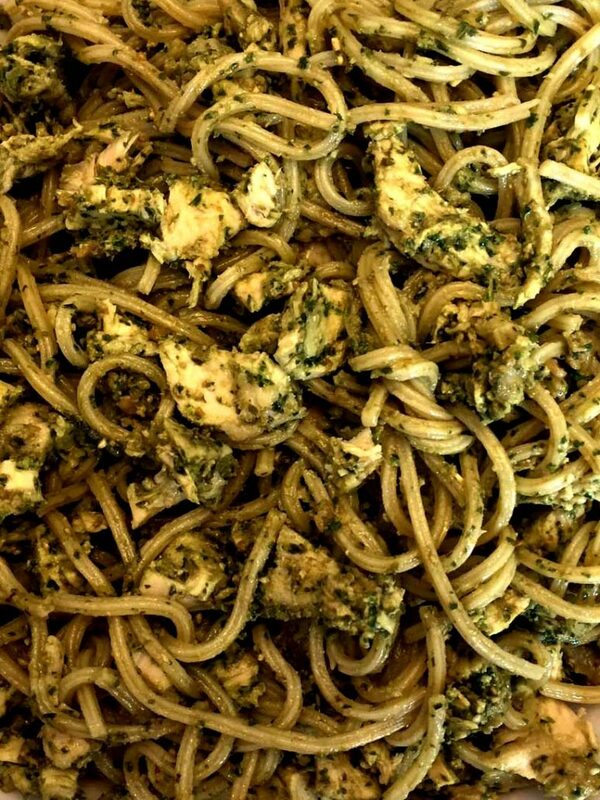 Just toss the cooked pasta with pesto and chopped cooked chicken, and your mouthwatering Italian pasta dinner is ready! 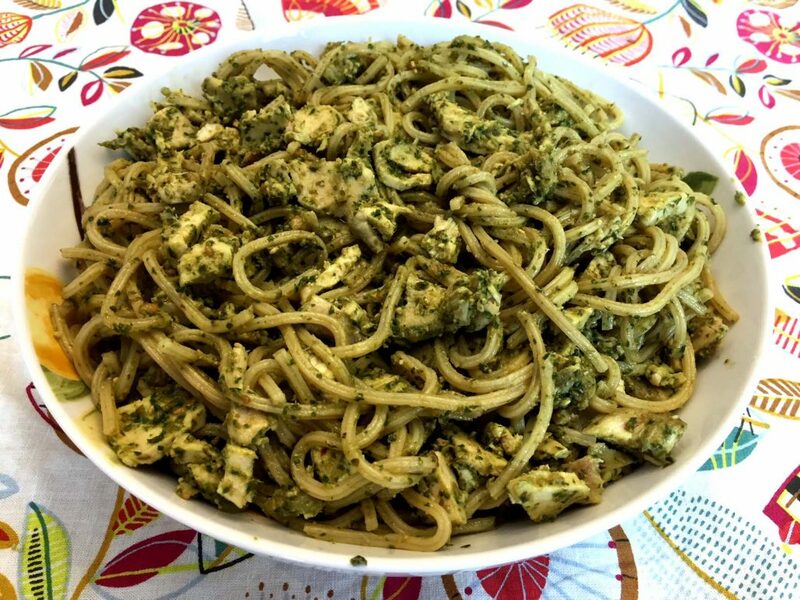 Yes, you just need 3 ingredients – chicken, pesto and pasta! Doesn’t get any easier than that 🙂 Whether you use store-bought or homemade, it’s totally completely up to you! 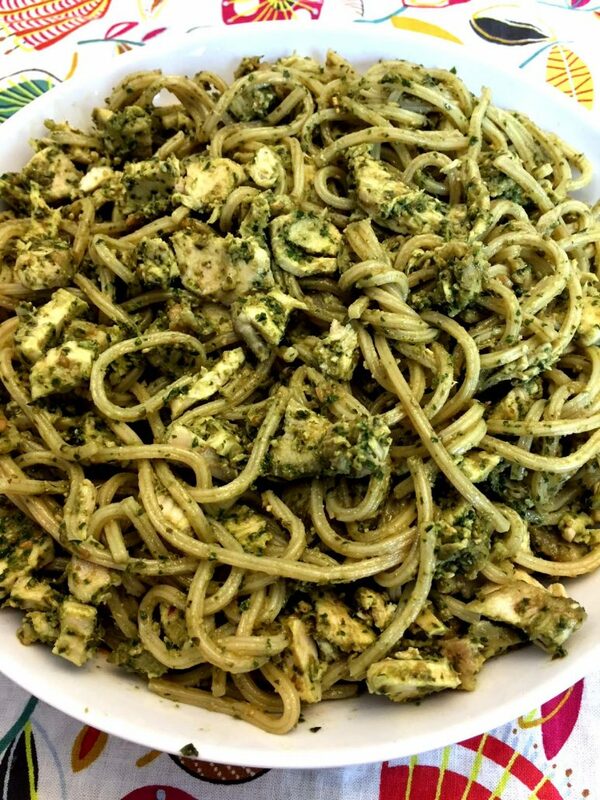 If you are feeling gourmet, make pesto and cook chicken from scratch. If you are pressed for time, canned chicken and jarred pesto to the rescue! 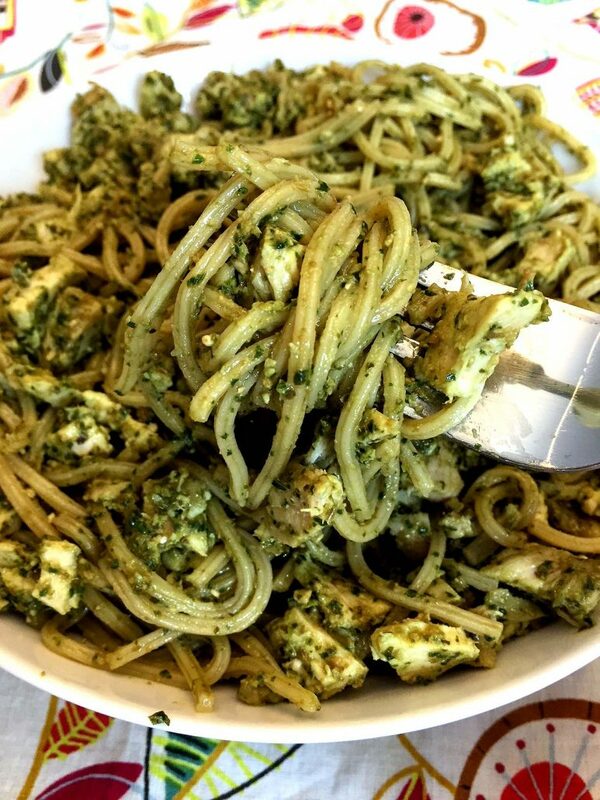 You can even create a chicken pesto pasta dinner kit in your pantry. 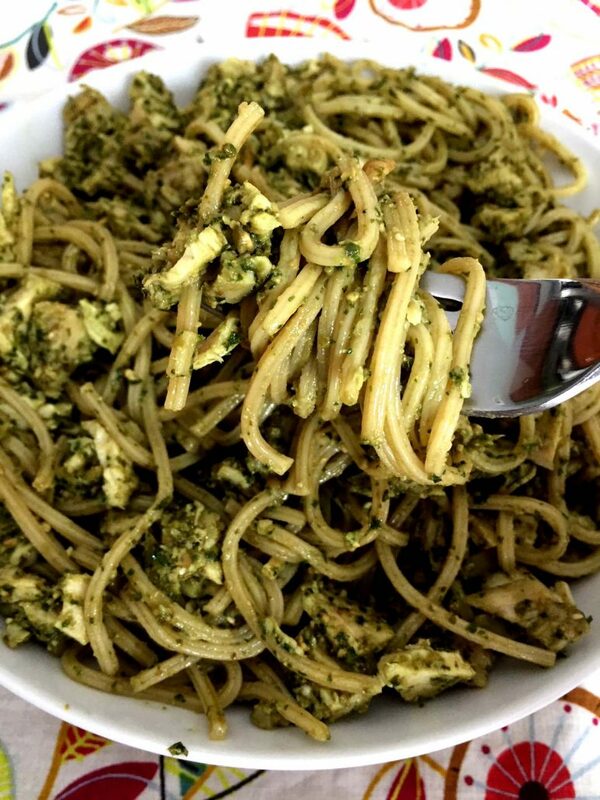 Just put together a box of pasta, two cans of chopped cooked chicken and a jar of pesto in a bag and label it “chicken pesto pasta” 🙂 This way you will know that no matter how lazy you are and how empty your refrigerator is, you still have supplies for a huge delicious dinner in your pantry! 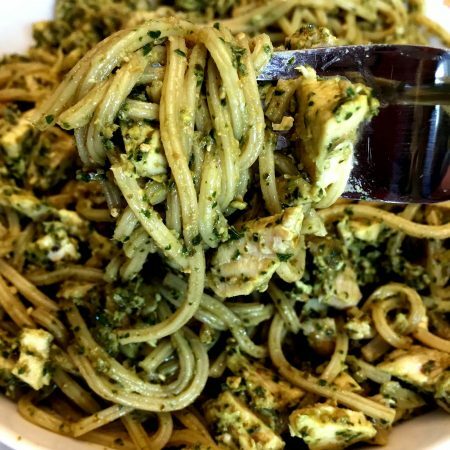 All you’ll need to do to get this chicken pesto pasta dinner on the table is boil a pot of water, cook the pasta, open the cans of chicken and pesto and mix everything together! Set a buzzer for 15 minutes, and your yummy pasta dinner will be on the table before the buzzer rings! If you have a little more time on your hands, take this chicken pesto pasta to the whole new level by making fresh pesto. 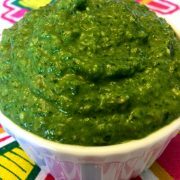 If you own a food processor, making pesto from scratch takes less than 5 minutes! 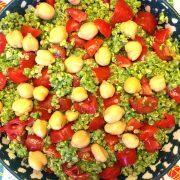 Just blend together fresh basil, garlic, extra-virgin olive oil, Parmesan cheese and pine nuts according to my food processor pesto recipe and enjoy delicious homemade pesto that’s so full of flavor! Whenever a recipe calls for cooked chicken, my go-to is Rotisserie chicken. 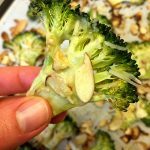 I have the whole collection of recipes that use up leftover Rotisserie chicken 🙂 With the store-bought Rotisserie chicken, you get fresh flavorful chicken without any work! And if you want to cook chicken from scratch for this recipe, of course you can! Just chop the raw chicken breast or thigh meat and quickly pan-fry on a frying pan until cooked through. Or you can poach chicken breast for a more hands-off approach – super easy! How much pesto should you use for a pound of pasta? It depends on how much you like pesto and how good your pesto is 🙂 The standard ratio is 3/4 cup pesto sauce per pound of pasta. If I’ve got a homemade pesto, I might use even more because I like it so much! If you are making pasta with store-bought pesto sauce, usually a jar of pesto is the right amount to sauce a pound of pasta. 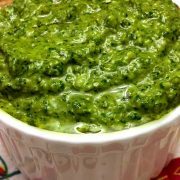 Homemade Basil Pesto – perfect pesto to use in this recipe! 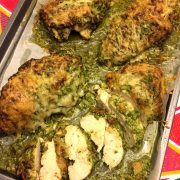 Baked Pesto Parmesan Chicken – chicken breast is baked with the Parmesan pesto crust on top! Creamy Garlic Pasta With Shrimp – super easy and yummy pasta for seafood lovers! 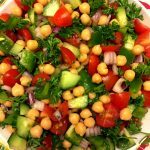 Easy Chicken Pasta Salad – a pasta salad that is filling enough to be a main dish! One Pot Pasta With Ground Beef – so hearty and delicious, comes together in one pot in 20 minutes! Buffalo Chicken Quesadillas – if you’ve got a Rotisserie chicken, it’s another great use of it, yum yum! 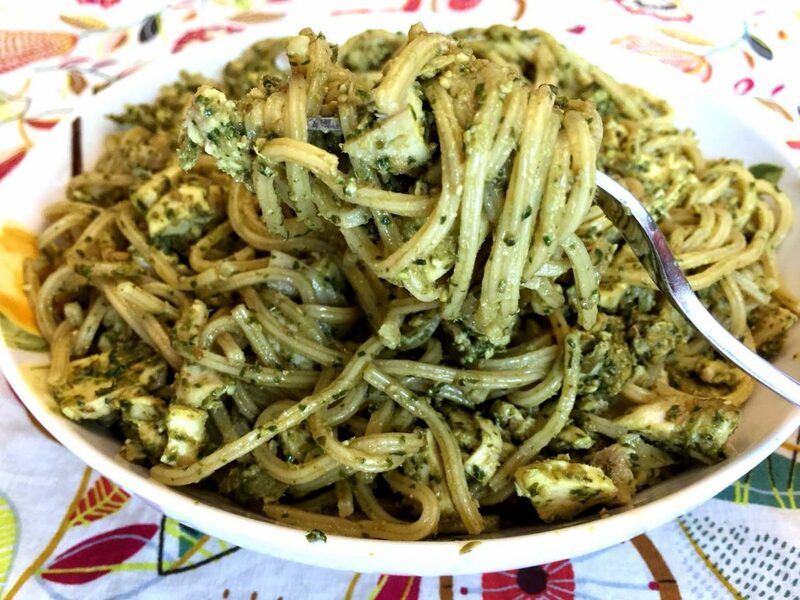 This 3-ingredient chicken pesto pasta is so easy to make and tastes amazing! This is going to become your favorite weeknight meal! Cook pasta according to package directions, then drain and return to pot. Add chicken pieces and pesto and toss until combined.